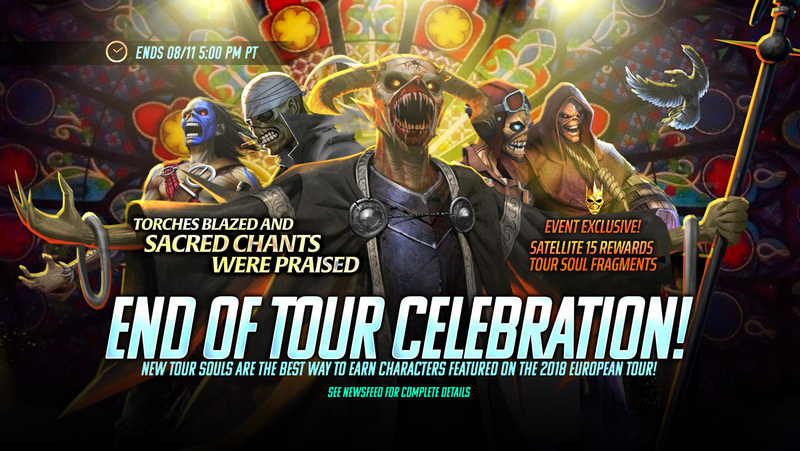 02 Aug Claim Free Tour Souls in Tour End Celebration Event! Tour Soul Available for Limited Time! The Legacy of the Beast European Tour 2018 is coming to a close. To celebrate the incredible run of shows over the past 2 months, we’re granting guaranteed fragments for souls which have an increased chance of Tour-featured characters! Collect from Satellite 15 for a bonus of Tour Soul Fragments from August 2nd to August 11th, 5 PM PT! Every Satellite 15 reward you collect will guarantee 10, 25 or 100 fragments in addition to normal Satellite 15 rewards! The Tour Soul is a limited time event soul which guarantees a 3★ to 5★ character of any class, and your best opportunity to get a wide variety of characters based on the set design and set list for the tour! Tour Souls are also for Ironite in packs of 1, 3 and 10 from the Specials store until the event ends.